Winter is officially here! 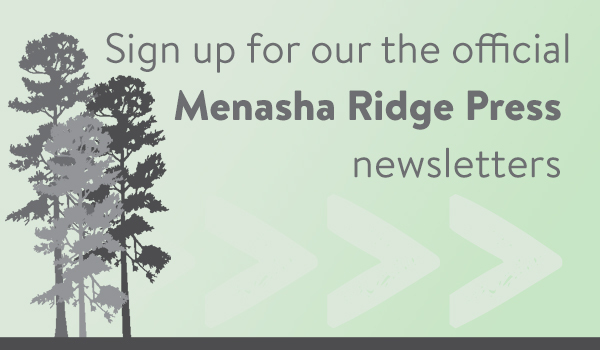 Just because the weather is getting colder and the precipitation is coming in the form of freezing rain and snow doesn’t mean it is time to stop hiking! In fact, hiking in the mid-Atlantic region during the winter offers many rewards for the trekker. There are few people on the trails, no bugs, lots of peace and quiet, and often some distinctive scenery. 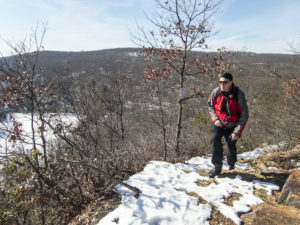 But hiking in the winter also requires that you be prepared for the elements in ways that differ from the warmer months. Most of the changes in my kit that I make for hiking in the winter are oriented towards keeping myself warm and dry. Here are 10 suggestions for adapting your winter kit to help make your cold-weather hiking experience a pleasant one. 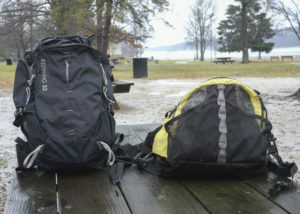 My summer pack on the right and winter pack on the left. During the summer I carry a day pack that is essentially an extra-large fanny pack with shoulder straps. It is lightweight and provides ample room for all my gear plus some additional camera gear. During the cold months when I need more gear to help me stay warm and dry, I opt for a larger pack. 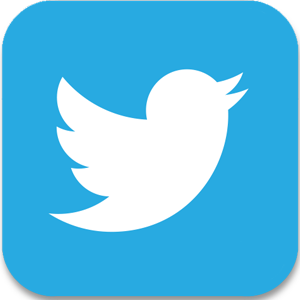 I have a Kelty Redwing 32. It holds 32 liters, which I find to be about the minimum size for all the gear that I carry on a day trip in the winter. Hiking in the winter can be more demanding on your feet than during the summer. You are likely to encounter wet and cold conditions, sometimes snow, sometimes ice. It is time to put away those nice lightweight hiking shoes and go for something more substantial. Waterproof is an especially important characteristic of winter footwear as cold and wet feet can lead to some serious problems. I am a fan of one-piece leather hiking boots because they are sturdy and resistant to moisture. My Scarpa boots aren’t insulated, but they are warm and have room for heavy socks. I also have a pair of insulated Sorels that are especially nice when the temperature drops very low, and they work well with snowshoes. They don’t, however, provide the arch and ankle support that my leather boots do. 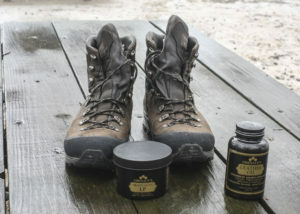 I always go with my heavy duty leather boots during the winter, and I treat them with a good preservative. To keep my boots waterproof I treat them at the beginning and end of the winter with a product called Obenauf’s Heavy Duty Leather Preservative. Unlike a straight beeswax treatment, Obenauf’s is made of a combination of oils suspended in beeswax and Propolis, an antibacterial tree resin. I have found it to be an extremely effective and durable treatment for all of my boots. In between my semi-annual treatments with preservative, I will supplement with a treatment of Obenauf’s Leather Oil. In addition to the heavier boots, you’ll want substantial socks to help keep your feet warm. 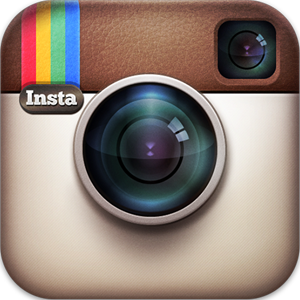 There are a variety of wool and wool/synthetic combinations on the market these days. SmartWool makes several heavyweight hiking socks that are soft and provide additional cushioning at the heel and ball of the foot. The key thing to keep in mind is that if the heavy socks make your boots tight, your feet are more likely to get cold. You want your boots to fit comfortably, even with heavy socks. You do need different clothes for hiking in the winter, although the same principles apply for dressing in the winter as they do in the summer. Leave the cotton at home, and think of layering. During the summer, I always wear a lightweight pair of nylon, convertible (you can unzip the legs and turn them into shorts) hiking pants. I wear the same pants during the winter, though with a lightweight wicking base-layer such as Capilene or a merino wool/synthetic material. If I get too warm, I can always remove the legs of the outer pants. I wear a matching base-layer on top; over that I will often wear a nylon tee or long-sleeve shirt. And I typically wear or have accessible a lightweight nylon pullover or wool sweater. In my pack, I carry a fleece jacket and, it if is really cold, fleece pants that I can slip into without removing my boots. I always carry a GORE-TEX jacket and GORE-TEX pants, and I wear or carry a good wool hat. I wear a wool cap all year. 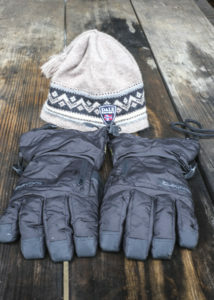 This is my winter hat and my snow gloves with a removeable liner that facilitates taking photos in cold weather. Because I take a lot of photographs when I am hiking, I have had to figure out a system for my hands that allows me to work with my camera easily. When it is not too wet or snowy, I wear a pair of silk glove liners inside a pair of fleece gloves or wool mitts. When I want to take a photograph, I can remove the outer gloves easily, and the liner allows me to work with my camera without exposing my hands to the elements. For very cold and snowy weather, I have been using a pair of gloves made by Dakine. They consist of a lightweight liner that fits within a lined nylon shell. They are extremely warm, and the liner itself makes for a good glove when the temperature isn’t too low. Over the years I have found gaiters to be an essential item, whether hiking in the winter or summer. They keep the water and snow and even dirt outside of your boots, where it belongs; they help to keep your boots and pant legs dry; and they help to keep your feet warm. You don’t need a whole lot of gaiter for it to be effective. A low-cut pair of gaiters works fine when there is no snow on the ground. 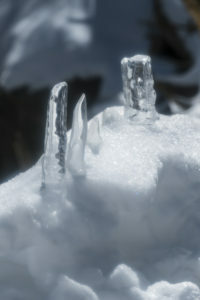 When you are hiking in snow, or if you anticipate walking through wet brush, a higher pair of gaiters will work better. I lean towards the higher gaiters during winter. My Stanley thermos. It’s heavy, but it keeps drinks piping hot all day. Hydration is equally as important in cold weather as it is in warm weather. As soon as the temperature drops into the 40s, I begin carrying a thermos filled with a hot drink, such as tea or cocoa. In addition to helping keep your core warm, the hot drink does wonders for your spirits. Although it weighs a lot, I carry a 1-liter Stanley thermos. During the past few years, a lot of companies have come out with insulated stainless steel water bottles. I have tried several of them, and have not been especially satisfied with their insulating qualities—they keep liquids cold better than they keep them hot. 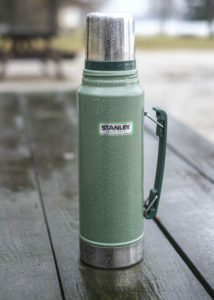 With my Stanley, I can count on having a piping hot drink all day long. For years I sat on my pack when I hiked during the winter. I also ate a lot of squashed sandwiches and broke several pairs of glasses. Then I started carrying a seat pad and my life changed completely! Not only does a pad smooth out the rough spots, but it also provides a barrier between your bottom and the cold ground. You don’t need anything fancy. 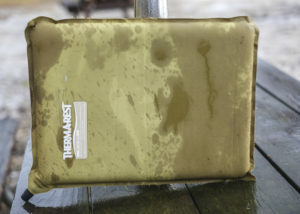 These days I use a small Thermarest seat that I pulled out of one of my kayaks. I have also fashioned seat pads out of old foam sleeping pads. You can, if you desire, get yourself a small camping chair and carry that with you. For a day hike, though, I find that to be overkill. Nothing fancy and here a little wet, but a seat pad like this can make your rest breaks a whole different experience. A pair of ice cleats goes into my winter pack early in the season and stays there all winter long. Falls on ice happen quickly and can result in bad injuries. If you find yourself on an icy trail, they are indispensable. Cleats allow you to get to places in cold weather that you would be unable to reach without them. There are several brands out there, including YakTrax, Microspikes, and ICETrekkers. 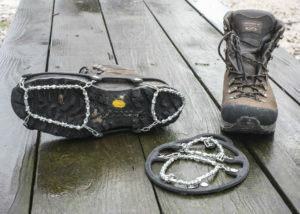 They all work by attaching a web of small spikes to the bottom of your boots so that you can walk directly on the ice without risk of falling. 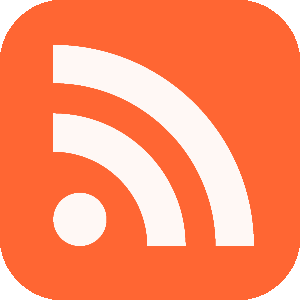 Some work better with softer boots than do others, and you will want to take that into consideration when purchasing them. Snow cleats stay in my winter pack all season, unless they are on my boots! There is another item that goes in my pack and stays there all winter. I have had several occasions when a small fire built during a lunch break helped warm people up and boosted morale. Because firewood in the winter can often be wet, it is helpful to carry a fire starter along with you as well as a lighter. Fat wood works well. I carry little packages of a kind of wax fire starter that I keep in a small dry box along with a lighter and some extra batteries for my headlamp. Some dry tinder can be tossed in the box to help with starting a blaze. There’s no doubt that hiking burns a lot of calories, and during the winter you will need to boost your intake to help keep yourself warm. I am not much for calorie counting, but when I am going out into the cold I carry foods that are high in fat and protein. Cheese and salami (or some other kind of meat) typically go in my pack during the wintertime, neither of which I eat much of at home or during the summer. Their fat and protein provide me energy that lasts and fuel to help keep my core warm. I also take nuts in some form, often mixed with raisins and chocolate both of which will provide a quick energy boost. 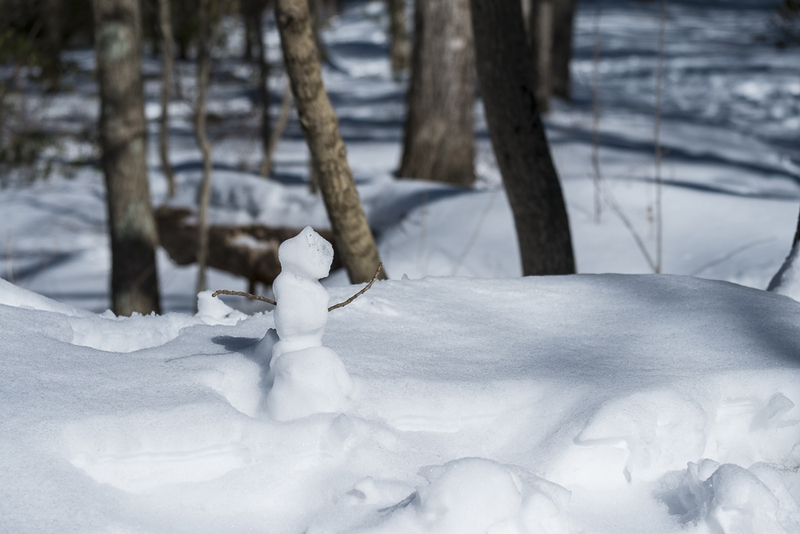 So there are a few things to think about as you get ready to hit the trails this winter. Good luck and happy hiking!